By far our most popular automata or mechanical toy workshop, especially with schools and ultra-busy events like science and making festivals. Using a box, pre-made parts, chopsticks and various bits and pieces, participants make a cam drive mechanism which bursts into kinetic life at the turn of a handle. Individual designs and decorations are inspired from the flow of the movement, using a variety of art/craft materials. The mechanical parts are all push-fit and can be adusted to enable experimenting with different cam formations and profiles as part of learning about cams and mechanical control systems. Single and double cam versions of the box are available. 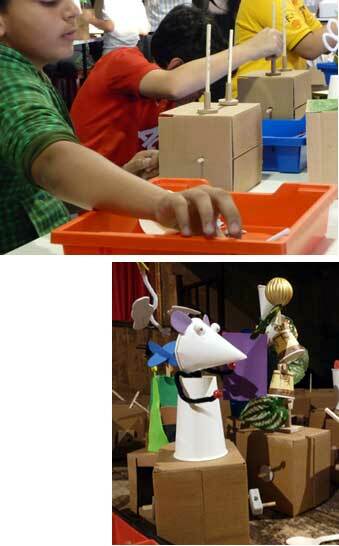 We also bring to venues a collection of demonstration and exhibition automata to play with and learn from. Time slot: 15 minutes to 2.5 hours. The time span is quite flexible as the workshop can easily be adapted to suit particular circumstances. School workshops are generally 2 – 2.5 hour sessions using the double cam box. The workshop can also be structured as an ongoing drop-in session. The box kits may be available on their own. If you are interested, do contact us.